At long last, after more than three months of real time and about 45 hours of game time (that's a lot of commutes! 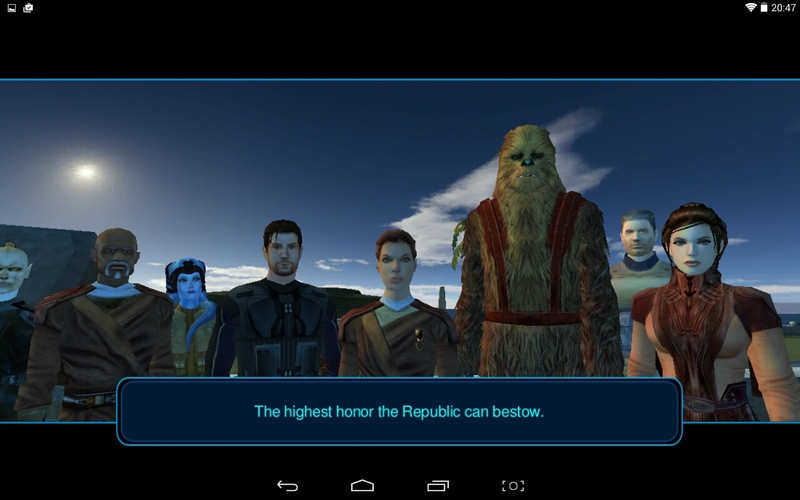 ), I finished the original Knights of the Old Republic on my tablet! I think I'll probably still have a couple of posts about it in me, to talk about what I liked, what I didn't like, and how it holds up in comparison to SWTOR the MMO, but for now I simply wanted to wrap up with the details of how my Revan's journey ended. After finally getting that last piece of the star map, I was off to the super secret star system that houses the Star Forge. 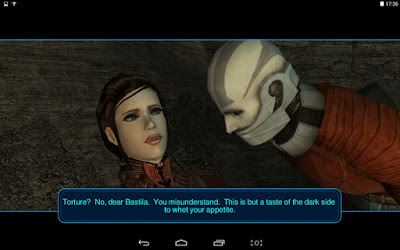 As soon as you go there, you're treated to a little cut scene of Bastila being tortured by Darth Malak in an attempt to turn her to the dark side - even if I hadn't already known what was coming up, I think that would have been a sure sign that this wasn't going to end well for her! The Star Forge system is full of Imps and the cut scenes that take place there actually look pretty cool even thirteen years later... space ships were comparatively easy to animate well with early 3D technology. Carth calls in the Republic fleet and you get pulled into another Sith fighter chase, which I once again survived with only a sliver of health left. Then your ship is forced into an emergency landing on the nearest planet because something is disrupting its systems. While the planet isn't given a name in game, a veteran SWTOR player obviously recognises it as Rakata Prime. 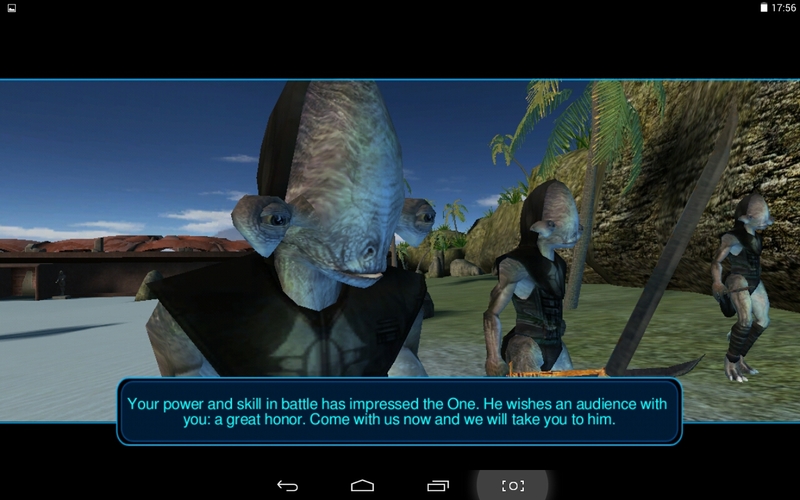 A funny touch: Remember that Gizka infestation that I picked up on Tatooine and that I refused to poison for XP? Well, on Rakata Prime they finally decided to disembark and started a new life hopping around the beaches. That amused me. The Rakata you encounter in this period are split into two tribes. The descendants of the ancient warrior caste are primitive, aggressive and breed rancors as their pets. The so-called Elders, descendants of the priest caste, are holed up in an ancient structure and are a bit more reasonable, though not really by that much. Both of them have met Revan before and basically go: "Yo, you promised to help us last time you were here but then just ran off, you'll do better this time, right?" However, since the two tribes absolutely loathe each other, it's impossible to get along with more than one of them. I was quite disappointed by how the game wouldn't even let me attempt to engage in peace talks. The first time you knock on the door of the Elder compound, if you introduce yourself as being sent by the other Rakata tribe, they literally vaporise your entire party instantly. And once you return to the warrior tribe after having talked to the Elders, they instantly attack you because they saw you talking to their deadly enemies. Seriously, guys! As I was beating up the guy at the entrance I wanted to yell at him to stop because all I had wanted to do was give him the damn quest item he had asked for. People are so unreasonable. I do wonder what the "canonical" outcome of this conflict is supposed to be, as the Rakata you meet on Rakata Prime in SWTOR are also primitive, however they do have some Force users again, whose reintroduction was a pet project of the Elders. Anyway... the whole reason you bother with these guys at all is that you need their help to enter the local temple to deactivate the disruptor field that's messing with the Ebon Hawk. Said temple is mostly a mini dungeon crawl, until the very end, when you're suddenly forced to do a sort of lights out puzzle with floor tiles. The moment I saw that I literally went "nope" and shut down my game for the day because there was no way I was going to figure that out on my own while on the train. I was completely rubbish at that quest in SWTOR too. Even after googling the solution, it still took me several tries to get it right because of how fiddly the movement controls are. Oh, and somewhere in the middle of the temple I picked up a few dark side points when I ran into a couple of Dark Jedi and greeted them with something along the lines of: "I am Darth Revan, bow to me!" I just wanted to see how they'd react! Why can't you see that I was only kidding, game? Anyway, at the top of the temple you run into Bastila, who - surprise, surprise - has turned to the dark side. You fight and argue, but soon she runs off to escape back to the Star Forge. You have to give chase, especially as her using her special Force powers is totally wrecking the newly arrived Republic fleet's offensive. Some other Jedi are sent along with you to help you get to Bastila, but in good "nameless friendly NPC" manner they die quickly, so it's up to you and your gang to save the day. Malak orders his men to throw everything they have at you... which leads to an interesting sequence of you fighting your way deeper into the Star Forge, with enemies streaming at you from all directions almost continuously, which I strongly suspect may be what gave Bioware the idea for all those skytroopers showing up out of nowhere in KotFE. The difference here is that a) while you're pretty powerful by this point, the hordes of enemies aren't complete pushovers and can still kill you if you don't pay attention, and b) it's obvious that you're on your way to the game's climax, so having to fight against what feels like overwhelming numbers seems somewhat justified in this context. The KotFE version just throws totally worthless enemies at you forever, even in the middle of chapter ten of sixteen, which is why it doesn't work the same way. 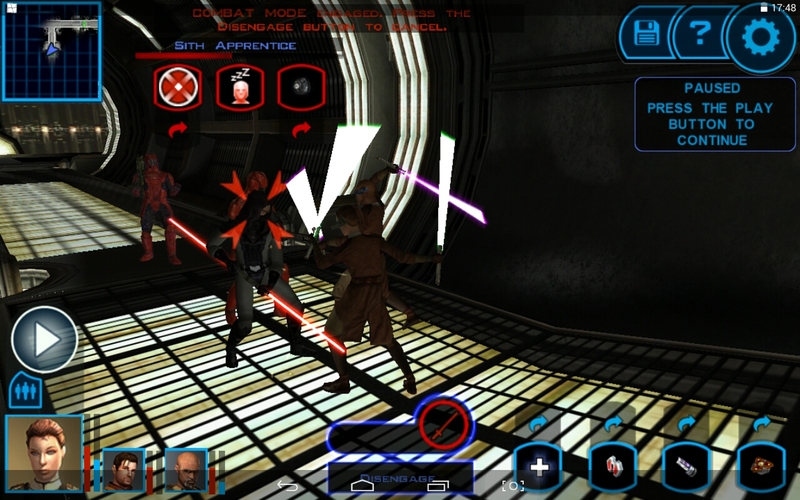 Though in all honesty, I even found the KOTOR version kind of tiring after a few rooms. Finally you find Bastila, who conveniently locks your two companions outside the room, never to be heard of again because that door remains locked even after the fight, for no reason. Once again you argue and fight, and since I was very much light side I kept trying to convince her to come back to the light too. It's kind of funny how she heals back to full after every "conversation break" - reminded me a bit of the end boss of Sith warrior chapter one and how you have to kill him three times over. However, my persuasion attempts seemed to go really well, as Bastila was acknowledging that there was still light within her and so on... just for her to do a complete 180 at the very end, insisting that we fight to the death. I'm not usually someone to reload an earlier save when things don't go my way, but that was just too annoying and befuddling. I tried again, choosing slightly different conversation options this time, but they only led to the same outcome: everything going well until the very end, when she suddenly raised her saber against me again and forced me to strike a killing blow. Somewhat annoyed, I took to the internet to look up a guide and followed the conversation options mapped out there to the letter... and voilà, suddenly Bastila was willing to convert. And to think that there was barely even any difference between that last attempt and my first one, except for one or two lines in the middle. Since Bastila is a) hurt and b) needed to help turn the tide of the space battle with her powers, it's up to you to face Malak down on your own. Nope, forget about your companions behind that door. You do find Malak in the next room down the hall, and in one more chickenshit Sith move, he tries to get rid of you by programming the Star Forge to throw an endless amount of Rakata droids at you. This was actually an interesting segment because they spawn just slowly enough that I initially thought that maybe I could simply kill them all off, but after several rounds of droid killing and watching them respawn yet again, I realised that I had to manipulate some nearby consoles mid-combat to shut down the production line. And then... finally, no more escape for Malak! The game's final boss battle is certainly interesting. He is a genuinely hard hitter, but more importantly he's got some half-dead Jedi stored in tubes around the room that he can drain for extra power, meaning that he takes the whole "heal to full" routine that Bastila demonstrated earlier up to eleven. Since I was struggling with that, I once again took to the internet and was highly dismayed to find that the most common advice seemed to be to destroy the pods with the Jedi in them to deprive Malak of his heals - except that they can only be killed with offensive Force powers, of which I had none except my stun, against which they were immune! What nonsense is this? Why won't my good old lightsaber do the trick? After dying repeatedly and running out of medpacks because the fight dragged on for so long I was close to despairing, but I took heart when I found accounts of other players in my situation having beaten the fight, and with a lot of running around and quick-saving I eventually prevailed. Malak died, the Star Forge was destroyed, and Revan and her companions returned to the Republic as heroes. What more can you ask for? 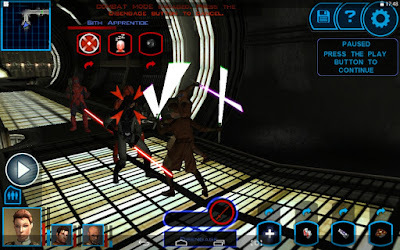 Too bad the odds for KOTOR 2 coming to mobile don't look too good right now. Early last year some news outlets speculated that it would be coming out "soon" after it was leaked that the game had received an ESRB rating which also listed it as available on various mobile platforms. However, since it's been one and a half years now and we haven't heard anything else about it, I wouldn't hold my breath for it for now. There's also a Selkath vendor on Manaan you can talk to and persuade (very much against his will, mind) to remove the Gizka painlessly from the Hawk. It's not much, but there are at least multiple peaceful ways to get them to leave. Out of curiosity, for the side quests (you may have a post about this coming up, of course), did you manage to find the ones with the GenoHaradan and the Mind Trap containing the Imprisoned One, who later crops up again on Tatooine in SWtOR? They're decent quests to do, even if the GH one is very deceptive in nature. Also, on the Star Forge there is a room which contains a locked chest with a secret reward: a wearable version of Darth Revan's armour which is either white with the hood down (light side) or black with the hood up (dark side). It isn't a crucial pick-up but it's a very nice-looking set of robes. By the time I got to the Star Forge my interest in exploring had pretty much dropped to nil; I just wanted to get to the end, especially with those big waves of spawning mobs slowing you down even more. The GenoHaradan quest was on Manaan, given by a Rodian who asks you to assassinate a prisoner in the Republic cells; it then spirals into a series of similar assassinations of individuals who are then revealed as four of the five joint-leaders of the GH. The fifth just so happens to be the original quest-giver, who is now the only person left to lead the organisation, and he used you to suit his own ends. He can then be duelled on Tatooine, although he tries once more to deceive you, as he requests a one-on-one duel but when you turn up by yourself he has an entire squad of mercenaries at his disposal. The Imprisoned One was on Korriban, again given by a Rodian. He tasks you with delivering the mysterious casket (although you'd of course have recognised it as a Mind Trap straightaway) and warns you to never ever open the box. Of course you investigate it aboard the Hawk, and are pulled inside to meet the Imprisoned One, who challenges you to a Hobbit-esque duel of riddles to determine which individual should leave in Revan's body whilst the other remains trapped for all eternity. The Mind Trap ends up on Tatooine because the Hutt in charge of the Swoop Racing in Anchorhead, Motta, had paid for it. Yeah, fair enough. Just thought I'd point it out because it is the only way to get a look similar to the actual Revan's gear in-game. You can't even get his mask if you go Dark Side! Huh, I don't even remember encountering either of those. Might well be that their quests are among those that only show up if you've done something else first. Though there's also always the chance that I simply missed them. In fairness, the KotOR sidequests are very easy to miss. It took me a couple of playthroughs before I found the GenoHaradan one, for example, and I'm fairly sure that there are some that I've never done for some of the various Companions.